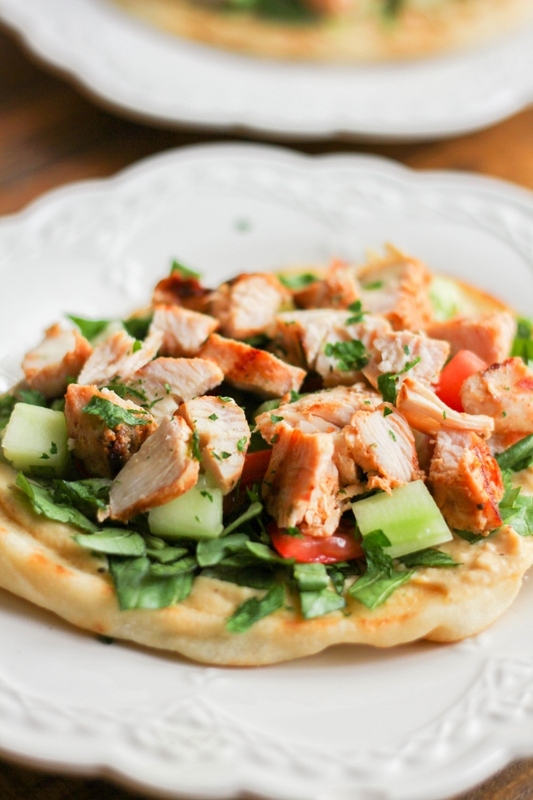 These fresh and delicious Chicken Shawarma Mini Flatbreads are packed with flavor and quick and easy to make. Perfect for game day, lunch, or even a light dinner, you'll definitely be making these again and again! Although Fall is knocking on our doors, I haven't given up on summer yet. The temps have still been pretty warm here in Michigan and although I'm excited to start wearing my boots and sweaters, I'm still hanging on to summer by a thread. This year I splurged and bought myself a beautiful dining set for my deck, and that's been one of my favorite spots these last few months. I eat out there, have my morning coffee, and even do a little work. It's just the perfect spot to sit and relax and take in the nature around me. Along with my pretty dining set I've got my trusty grill. I don't know about you, but I will grill up until the time it snows. I'm not afraid of a little cold air! Food seems to taste more delicious when it comes from the grill, plus clean up is a cinch. 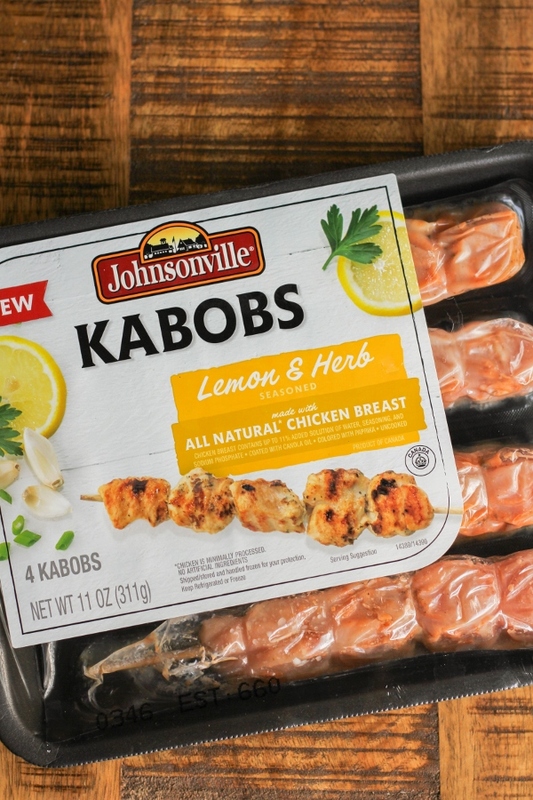 One of my new favorite things to grill are these Johnsonville Chicken Kabobs. Have you tried them yet? They come in four varieties - Lemon & Herb, Teriyaki, Sweet BBQ, and Sweet Chili Lime. They're all natural, gluten free, and there's no added MSG. Plus they cook quickly and are super delicious! 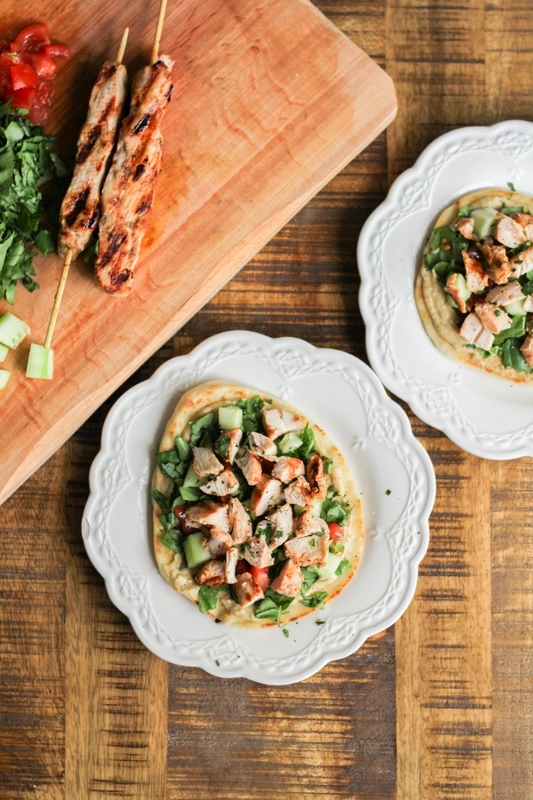 I recently used the Lemon and Herb Kabobs to make these amazing Chicken Shawarma Mini Flatbreads. It's a super easy recipe and can be on the table in no time. While the chicken is grilling you can chop the veggies and toast the flatbreads. 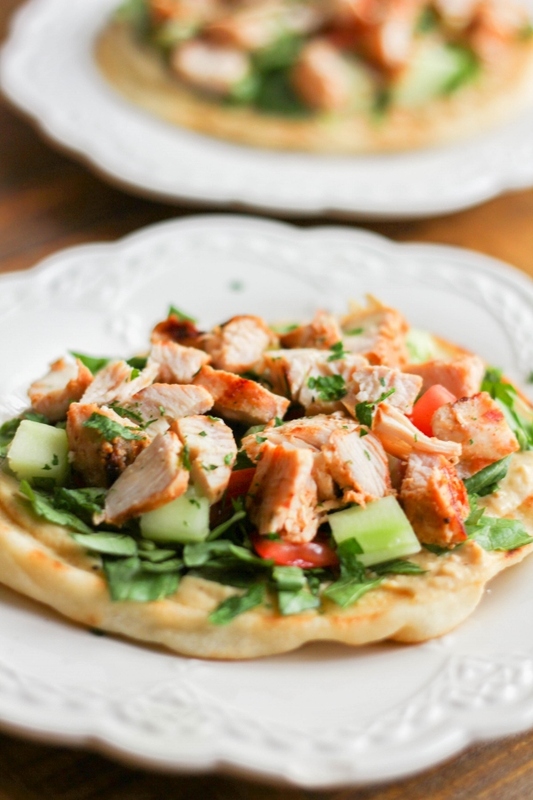 Once the chicken is done, it's all about building these beautiful flatbreads. Next thing you know, dinner is served! 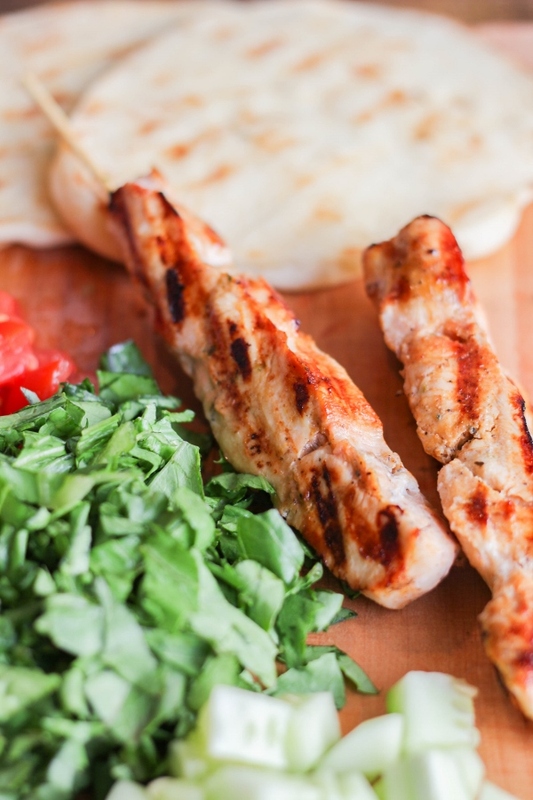 Any variety of the Johnsonville Chicken Kabobs would be great in this recipe. The flatbreads are fresh and full of flavor, and perfect for game day, lunch, or even a light dinner. Although I grilled the kabobs on an outdoor grill, you can also use an indoor grill or even a grill pan on the stove. Preheat the grill to medium-high and spray the grates with non-stick cooking spray. Grill the kabobs for 7-10 minutes, or until they are cooked through, turning on all sides. While the kabobs are cooking, toast the flatbreads. 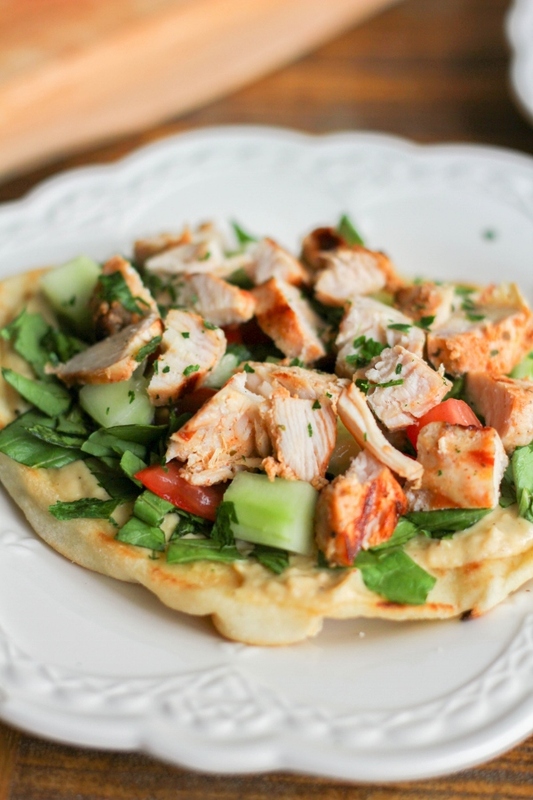 To assemble, spread each flatbread with about 1/4 cup of the hummus, then top each with lettuce, cucumber and tomatoes. Dice the chicken into smaller pieces and divide between the flatbreads. Top with a sprinkling of parsley. Serve immediately. 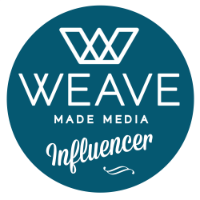 I received free products for recipe development, however, I received no additional compensation. All opinions, as always, are my own.